Many months ago I did a post detailing the different kinds of flour available to most consumers. Of course, I didn’t outline every different kind of flour, but I went over some of the most common kinds that you’ll probably find in the store today. After the last Guess The “Food” post, a reader emailed me and suggested I do a similar write-up for sweeteners. As you probably know, there’s an enormous range of sweeteners and sugars available today, so I’ll do my best to summarize the types of sugar. Before I get too far into this, I’ll just reveal my personal habits with sweeteners as it will undoubtedly affect how I write about them. First, I try to avoid no calorie sweeteners. They just kind of weird me out. The one exception to this is Diet Dr. Pepper and Diet Coke. I probably drink one or two a week and I honestly drink them because I prefer the taste over the regular variety. Other than that, I use granulated sugar or honey in my coffee and never substitute for it in baking recipes. I use brown sugar in oatmeal. I use powdered sugar when I’m baking things that need it like icing for Mocha Brownies. You read it here first. I’m not trained in either chemistry or nutrition. But I do read a lot about food and obviously care about it. So there ya go. Now that you know all of my dark deep secrets, I’m going to break up this post into two different areas: Sugars and Artificial Sweeteners. The line is sometimes a bit hazy on what’s natural and what’s artificial these days, but I used my best judgment to categorize them. Maybe. That’s up to you. I think it’s important and also interesting to know something about what we’re eating. Hopefully, you can look at a list of ingredients after this post and at least identify sugars and artificial sweeteners from the list. I should note that there are a ton of real natural sugars in fruits and plants. It’s why fruits and some vegetables like beets are naturally sweet. Real natural sugars are rarely in a form that could be added to anything else. Therefore any sugar you find in the store is processed to some degree. The sugars that I’m listing here are processed mainly from sugar beets or sugar cane which are very sugar dense. The exception to this is the first one on the list. Honey – If you want unprocessed sugar, honey is about as good as it gets. You can find it in nature in the same basic form you find it in the store. Most honey is at least 80% glucose, fructose, maltrose, or dextrose which are just variants of sugar in nature. Honey also normally has some vitamins and minerals in it and is known for its antioxidant properties. It’s also great for a sore throat! Turbinado or Demerara Sugar – While these aren’t technically the same thing, they are very similar. Both products refer to sugar that’s been extracted and crystallized from sugar cane with very minimal processing so some of the natural molasses remains. Note that this results in a brown or tan sugar but isn’t at all the same as what’s typically marketed as brown sugar. Confusing right?! Brown Sugar – Brown sugar is one of my favorite things. I love love love it on oatmeal. It’s one of those products though that makes you go “Huh?” when you hear how it’s made. Most brown sugar is made by processing out all of the molasses from sugar beets or sugar cane and then adding it back in to get the brown sugar flavor and color. Depending on whether the final result is light or dark brown sugar, different percentages of molasses are added back in. Brown sugar is used a lot in baking and, in my opinion, is very delicious. It tends to have a softer texture than the turbinado and Demerara sugars. Granulated Sugar – This is what we all know and love as sugar, the granulated crystals of sucrose that we consume by the pound every year. Almost all of it is extracted from sugar beets or sugar cane and is processed by evaporating the liquid and extracting the molasses. What’s left is the tiny little crystals we love to sprinkle on donuts. Powdered Sugar – Also known as confectioner’s sugar. It’s basically just normal sugar that’s ground very finely and then mixed with ingredients that prevent caking. I guess you can make your own, but I’d only do it in a pinch. Just seems like a lot of work. Corn Syrup – Corn syrup and its more popular high-fructose variety are all the rage these days. I think the jury is still somewhat out on whether it’s bad for you in and of itself. What scares me a bit about it is that it’s finding its way into all kinds of stuff these days because it’s really cheap. Have you checked out your ketchup, pasta sauce, or loaf of bread recently? It might have some corn syrup in it. So it’s probably fine in moderation, but it’s also near impossible to moderate it because it’s in everything. These are things that do not, as far I know, occur any form in nature (except Stevia). They were made by us humans with the goal of keeping that sweet flavor we craved without the calories that came along with it. There are many more sugar substitutes than listed below. These are just the most common that you’ll find. Saccharin –Saccharin is one of, if not the, oldest sugar substitutes. It’s 300 times as sweet as normal sucrose (sugar) and therefore is used sparingly. It’s marketed in the US as Sweet ‘N Low. There was a lot of debate over the years about whether or not Saccharin was healthy for humans. The U.S. removed it from the list of cancer causing agents awhile ago, but there is still a warning label on the packaging, so take that for what you will. Aspartame – Marketed normally as Equal, NutraSweet, or Canderel, this is an artificial sweetener that’s about 200 times as sweet as normal sugar. As with most artificial sweeteners, it does actually have caloric content but because it’s so strong, it can be diluted so that its caloric addition to foods is basically nothing. Aspartame is popular in drinks and some products (my Diet Coke for example) but it doesn’t work well in baked goods because it loses some of its sweetness when heated. Neotame – Ok. So this stuff is big time. It’s 7,000 to 13,000 times sweeter than sugar. I can’t even fathom what that tastes like. The good news is that it’s so strong that it’s only in trace amounts in whatever product it’s in so it’s pretty safe for consumption. It’s also in NutraSweet. Acesulfame Potassium – This isn’t as popular an additive by itself because it has a slightly bitter aftertaste. It’s very stable under heat though and prolongs shelf life for items so it’s usually mixed with other sweeteners. It has some concern over health, but the USDA has said it’s safe for human consumption. Stevia – Stevia is the latest and greatest of sweeteners coming onto the scene although it’s been available in other countries for awhile. There’s some debate that the reason it hasn’t been officially okayed in the US is because it’s naturally occuring as an herb and therefore you can’t get a patent for it and therefore it could really compete with the sweetener industry and so on and so forth. It’s marketed as, well, Stevia, and I think I’ve seen a few commercials for it recently. At the end of the day, it’s hard to say what’s okay and what’s not. There’s been so many studies on all of these and so many slightly newer studies that contradict the older studies and it can all really make the average person’s head spin. I’d say the important thing is to remember moderation. If you start consuming cups a day of either sugar or acesulfame potassium, you’re probably going to be in trouble. So… as always when I attempt to write summaries like this, I’m fairly certain I’ve missed something. So if you have anything to add on any of these or other sweeteners, leave a comment! When I saw today's title I was expecting a baklava recipe! 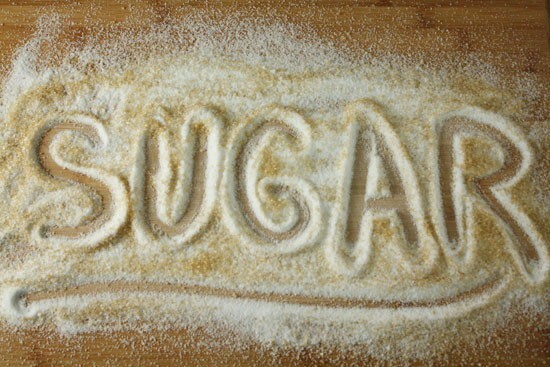 This is a great roundup of sweeteners though – thanks! What about molasses on its own? I don't know much about how I should use it other than ginger bread. Could I put it in my oatmeal? Of course! I knew I’d probably miss one. I’m not sure I’d add molasses to oatmeal unless you LOVE the flavor. It’s pretty overpowering in my experience. A little goes a very long way. What about good ole fashioned maple syrup. I love using it to add sweetness to dishes. Definitely a good one. The real stuff is the best. RE corn syrup: my objection to corn syrup being used in so many foods as a sweetener is the *flavor* it adds – which I really do not care for! For example, if you go out and order a Margarita from the bar, it's likely made with a mix (yuck), and all I can taste is the corn syrup in the mix (along with whatever artificial "flavors") – it's nothing at all like a *real* Margarita made with simply tequila, triple sec, and lime juice! As for the artificial sweeteners, the fact that they are orders of magnitude sweeter than sucrose poses a problem: most artificially-sweetened products are TOO sweet for my preferences (and the artificial sweetener also imparts its own – sometimes unpleasant – flavor to the product). Perhaps I am sensitive to the differences – or "nuances", if you prefer, but it does affect whether or not I enjoy the flavor. I'm a nutritional science graduate, and I just wanted to add that you definitely shouldn't cook with aspartame. It doesn't just lose sweetness but it tastes outrageously terrible. It breaks down into the phenylalanine (which a protein) and methyl alcohol, which creates formaldehyde after being metabolized. Its been shown to be safe otherwise. Also if anyone is curious about anything Nutritional Sciencey, I'm currently very unemployed and would love to spend some time answering some questions, as I have quite a bit of it on my hands these days! Also, Has anyone tried Stevia yet? I haven't seen any studies on it, but when I tried it, it tasted pretty terrible. Nick, I think you hit the nail on the head when you said that we should use moderation. I just read somewhere that Americans on average eat 120 lbs. of sugars per year, or roughly 1/3 lb/day. Depending on the type of sugar (sucrose, HFCS, etc.) this is between 500-600 kcal/day. That is a load of sugar! I know a lot of people are on the anti-HFCS bandwagon, but I think we should just be on the 'eat in moderation' bandwagon. More fresh fruits and veggies, more whole grains, fewer 'food-like edible substances'. There’s also agave nectar and raw honey as opposed to the processed stuff and also golden syrup. Okay, one thing about stevia. I would love to use it, but am deathly afraid of it’s prevalence lately, as it is a cousin of ragweed. I found out I have an echinacea allergy, and thus a ragweed allergy, making me in turn allergic to stevia. Big problem as stevia is now turning up in loads of products as a “natural sweetener”, not listed by name. I get a sore, itchy throat when I drink something containing it, and I don’t want worse things to happen! Whoa. That's interesting… didn't know that. Thanks for the info Tobi. That would also be a problem for me as I am also allergic to ragweed. One thing about Stevia is that apparently dogs (and probably other animals) can't eat the stuff, so be careful when giving your pets scraps of food containing it. Probably should be careful about other types of artificial sweeteners as well. Not that they should be eating table scraps of any kind anyway, but it's definitely not worth losing your pet over. This is super concise and helpful! You mentioned making your own powdered sugar “only in a pinch” so I wanted to throw out there that that is one of the very few ways to get vegan powdered sugar. Lots of granulated sugar is processed with bone char and there’s really no way to know the difference (for the most part). So it’s “easiest” to take your turbinado sugar and turn it into powdered sugar. Also, I wanted to comment on Vernon’s comment about being on the moderation bandwagon instead of the anti-HFCS bandwagon. I agree but I also think that since HFCS is in pretty much EVERYTHING it’s hard to do one without the other. Unfortunately some people have little choice but to rely on processed foods more than fresh/whole foods – I mean just look at your local grocery ad. Add up how much it would cost to feed a family of 4 with fresh/whole foods. Now calculate how cheaply you can feed that same family from the “10 for $10” food which are all horribly processed garbage “foods.” Until we fix the system that causes people to have to buy their food at the Dollar Store we should make the food they can afford less of an assault on their health! I’m pretty lucky that even though we are low/single income that I place a higher priority on things like eating well and educating our child. We don’t own a car and live in a bad neighborhood. A huge part of the reason for that is so that we can afford to shell out the extra $100 every 2 weeks to feed our family nutritionally sound foods (and also to pay to have our son in a good school). I cave for those 10 for $10 things sometimes but I work really hard to keep my child healthy! Not everyone has that same luxury though. Sorry… that was a rant but I feel like it’s an important one!